The best of The Bristol Hi-Fi Show 2019 | What Hi-Fi? The Bristol Hi-Fi Show was once again the place to be for all things two-channel over the weekend, along with a sprinkling of AV for good measure. There were just enough new launches to keep us busy, as well as the chance to see and hear plenty of products that have been released in recent months and years. Acoustic Energy used the Bristol Hi-Fi Show as a launchpad for its flagship 500 Series of loudspeakers. The AE500 standmounters (£1000) and AE509 floorstanders (£2300) use newly developed carbon fibre tweeters, mid/bass drivers and are set to go on sale in the spring. ATC might be better known for its stereo speakers, but the company has been known to dip its toe into the world of hi-fi electronics now and then. Its latest offerings take the shape of the CD2 CD player and SIA2-100 stereo amplifier. They're due on sale in April. Centred around DTS Play-Fi streaming technology, the 6000-N music streamer is the latest model to launch as part of Audiolab’s 6000 series of hi-fi separates. There’s hi-res, multi-room and DLNA support, plus the ability to stream direct from the likes of Spotify, Tidal, Deezer and Amazon Music. While we're always on the hunt for what's new, the show is just as much about having the chance to see and hear the products you've been reading about over the previous 12 months. B&W's room is always popular and the new 600 Series was attracting plenty of attention. One of the best-sounding rooms at the show came courtesy of Chord Electronics, with some help from a lovely pair of B&W 805 D3 speakers. Chord's main focus was showing what its new Hugo M Scaler could do. This slab of electronics (it's on the top shelf, above) utilises Chord’s most advanced filtering technology to upscale 44.1kHz digital audio up to 705.6kHz – 16 x CD’s 44.1kHz native resolution – before it is passed on to the DAC. It's all about delivering every bit of audio information and it certainly sounded worthy of serious investigation if you have a suitable system. Creek Audio is marking its 37th year in the hi-fi industry not only by moving its production from China to Europe, but also by fully redeveloping its product line-up. At the show Creek was showing the Voyage CD10, the i20 stereo amplifier and the CLS6 speakers. Dali was exhibiting its well-received Oberon range of loudspeakers, including the five-star Oberon 1 standmounters and Oberon 5 floorstanders. Speakers might have dominated the show, but Focal was flying the flag for headphone-based desktop systems with the help of its stunning Stellia over-ear headphones. They were being powered by the company’s new Arche, a £2499 headphone amp/DAC. Fledgling speaker company Fyne Audio will be hoping to continue its success with two new speakers: the flagship F1-12 floorstander (from £23,999) and a 'Special Production' F502SP floorstander (£3500). Cheap, they're not, but they did look pretty special. KEF’s room was awash with colour thanks to the company’s LSX range of powered desktop speakers. The company also had its R Series on display too, including the Award-winning R3 standmounters and R5 and R7 floorstanders. Mark Levinson was showing-off its new 5000 Series of integrated amplifiers, including the top-end No.5805, pictured above. It weighs in with 125 watts per channel and features a 1in thick bead-blasted, black-anodised front panel, and Mark Levinson's iconic hourglass control knobs. The No.5805 is due to go on sale in the first quarter of 2019 for $8500. Musical Fidelity’s latest hi-fi separates were on display at the show. The M2Si is a no-frills 76W per channel stereo amp while the M2sCD CD player features a mains choke filter and digital noise filter. Both components cost £799 and are available to buy now in black or silver. Pro-Ject unveiled four new turntables at the Bristol Hi-Fi Show, priced between £230 and £1200 and due on sale this summer. The arrival of the new decks will simplify the Austrian manufacturer's turntable range, likely replacing the multiple variations of the existing Xpression and Xperience midrange models. Lurking in the Rega room was a brand new stereo amplifier, the Rega Aethos. It’s a 125 watts per channel design that’s due to go on sale in May/June. Rega’s opted for the most pure analogue design possible, so only line level inputs, no DAC and no phono stage. There is a headphone output, though. Expect the Aethos to retail for £2999. Sennheiser had no shortage of headphones on display at the show with everything from the Momentum True Wireless in-ears to the high-end HD 820 over-ear headphones (powered by a Sennheiser headphone amp). Launched at CES 2019, Sony’s new Bluetooth turntable, the PS-LX310BT was spinning at the show. The deck features a built-in phono stage, gain adjustment, 33/45rpm speed settings and is set to go on sale in April for £220. 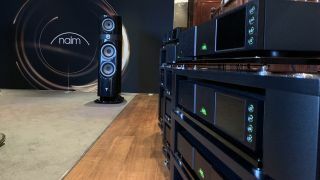 Wharfedale’s working on a new premium speaker range called Elysium, which was spotted at the show. The range is set to arrive in the middle of 2019 with a floorstander and standmounter priced at around £3500 and £2000 respectively. Of course we have to mention our own demo room. We were showcasing 8K TV, with a 75-inch Samsung 8K QLED and just about all the 8K content that exists. We were also showing off just how good you can have it right now with 4K Blu-ray and a 7.2-channel B&W sound system. Yamaha’s all-in-one streaming turntable was on display at the show. Working over Wi-Fi, the deck can stream to Yamaha’s MusicCast range of wireless speakers, stream hi-res files over a home network and also comes with support for streaming services such as Spofity, Tidal, Deezer and Qobuz. It’s on sale now for £549.